Home > CPAP Machine Toronto > What if my CPAP Mask Irritates my Facial Skin? There are several reasons that your CPAP mask can irritate your facial skin and when you are experiencing a rash from your mask it is hard to keep it in place. The options you have depend on the situation you have with your skin. If you already have irritated skin from a rash then you need to check out these options. Ask your doctor for some Benadryl or other antihistamine to help reduce the rash. Use a filter for between your face and your mask. Make sure to clean your mask daily while you are dealing with skin irritation. Use moisturizer on your face. If you sleep on your back and your facial skin is irritated try sleeping in your recliner where your head is slightly raised which will put less pressure from the mask on your face without breaking the seal of the mask. Wash your mask daily and allow it to dry on a clean mat until bed time. Wash your head gear once a week, if you notice that it isn’t enough to prevent irritation then wash it every 3 to 4 days. Allow it time to dry before bed. Wash your face before bed every night with a hypoallergenic face wash that has a moisturizer in it or put a moisturizer on each morning. Also remember because you are washing your face more, to use lukewarm water not hot. Use a filter between your mask and your skin. There are filters no matter which mask you use. What if I am allergic to what the mask is made of? **Extreme allergic reaction should be seen by the doctor. If you are having difficulty breathing please go to the emergency room and take your mask with you if you were fine before going to bed. If it is severe enough to cause blisters and swelling then see your doctor and respiratory therapist both. Many people find they are allergic to latex so the masks for CPAPs are made from silicone. This generally a non-allergic material; however that is not to say that someone with extremely sensitive skin will not break out or have a red line around where the masks sits on the face. In this instance first try a liner between the mask and the face to see if it helps. If it does make sure to routinely wash your mask, wash your face each night before going to bed, and insert the liner between your face and the mask to continue the help it has given. 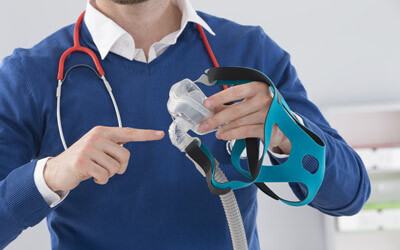 If you continue to experience problems please talk to your respiratory therapist or medical equipment dealer about your mask and what it is doing. They may need to refit your mask or you may need to change your mask to a different style.